Do you have a hard time getting up and down stairs? You’re not alone. Every year, thousands of people struggle with problems posed by the stairs in their home. At All-Ways Accessible, we have safe and affordable solutions that can make your home livable again. Stairlifts go by many names: electric chair lift, stairway lift, stair climber, and others. The bottom line is that they get you where you need to go, with reliability and efficiency. At All-Ways Accessible, we proudly install stairlifts in New Hampshire, Massachusetts, Maine, and Vermont. Our clients find that installing a stairlift in their home is the easiest, most economical option for making it livable again. Before you consider moving, remodeling your home, or living on a single level, why not give All-Ways Accessible a call? We’re a brick-and-mortar store that sells value and quality, first and foremost. While it’s tough to give a single definitive price point, Stairlifts for straight staircases with appropriate head clearance can cost between $2,800 and $4,000 for full installation. Beyond that, factors like curves and landings can add to the design and installation costs. It’s always best to have one of our accessibility specialists evaluate the site. We’ll check out your staircase at no cost or obligation to you! Our goal is to help determine the right stairlift for your needs. Considering Having a Chair Lift Installed In Your Home? 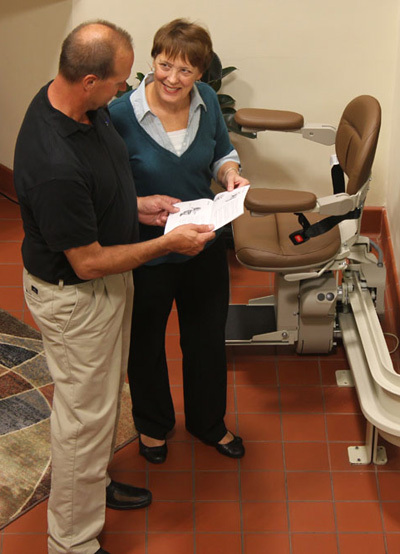 Not all chair lifts are created equal… that’s why it’s important to know what factors will meet your specific needs! Everyone has a different body type, and some people can operate machinery more effectively than others. Your Stairlift needs to be just right for you. Things like staircase landings, stair height and width, and flooring materials all play a role in which chair lift is best for you. Come visit our design center and explore your options! We’re just a short drive from anywhere in NH, ME or VT.The lift specialists at All-Ways Accessible will evaluate your home, educate you about the best options, and even give you a chance to test out different stairway lifts in our showroom! Call 800-684-0270 and schedule your Free in home stair lift evalution today. Email us to schedule a stair lift test drive in our show room. All-Ways Accessible has just undergone a major renovation to its showroom. We have 2 brands of stair lifts for you to ride and compare. Test the safety features, check out the color options, and choose the stairway lift that best suits you and your home. Schedule your test drive today. Our lift specialists will travel to your home and perform a complete evaluation of your stairway AND your home to assist you in selecting the stairlift that suits both your abilities and your environment. And they will leave you with a written estimate. No pressure, no pushy sales gimmicks, just information and the freedom to choose. When most people think about a stair lift, the standard straight stair chairs are the ones that most often come to mind. The majority of homes have a basic, wooden, straight stairway. People often ask how wide the stairs need to be to accommodate a stair lift. We tell them that if the stairs are 32 inches wide or wider, you can install a stairlift on it. However, a person’s height and some other factors can impact whether a lift will work on a narrower set of stairs. That’s why we like to do a home visit; we want to make sure the lift is right for you AND your home.This is just one of the many reasons All-Ways Accessible is known for providing value to it's customers. The biggest misconception about stair lifts is that the rail is installed on the wall, when in fact, with almost every straight stairlift, the rails are bolted to the stairway. If your stairway is made of something other than wood, that doesn’t mean you can’t install a stair lift – it just means it will take some extra special care to install it properly. Because straight stair lifts are the most common chair lift option, All-Ways Accessible maintains an inventory of two different brands so we are ready to install your stairlift as quickly as possible. Stairways are like snowflakes, no two are alike, and not all of them are straight. That’s when a custom-designed and digitally - configured curved stair lift makes the most sense. By using high tech measuring software and a special camera, our lift specialist can ensure that your custom curve stair lift fits perfectly! Here at All-Ways Accessible, we do not recommend curved stairlifts that use modular rail systems (these are basically standard rail pieces that are “fit” together). Modular rail products are hard to fit and require several attempts to get the rail angles correct. This can mean a lot of extra holes in your stairway. One man drilled 136 holes trying to make a modular rail system fit his stairway before contacting us about a custom engineered rail system. Yes, the custom engineered rail takes longer to get, but we believe it makes for a better fit, a better installation and a much more satisfied customer! Stairlifts come in all varieties of makes and models. In addition to the chair lift system itself, there are also numerous features and accessories that allow for easier and more comfortable use. At All-Ways Accessible, we’ve selected the top industry options that offer the most flexibility and value for our clients. When most people think about a Stairlift, they picture a standard, straight seat lifts. They’re surprised to learn that Stairlifts can be customized to accommodate all manner of staircases. There are some limiting factors to chair lift installation, such as the width of the stairs. Whatever your living situation, our experts can assess both your home and your personal needs, delivering the quality lift you deserve. Looking to improve the quality and accessibility of your workplace? We provide stair consultations for building owners around New England. Sometimes an elevator isn’t quite right, or perhaps a commercial Stairlift makes more sense in a certain area. Whatever your workplace situation, we offer a range of models and can install any Stairlift at an affordable cost. The lift specialists at All-Ways Accessible are always happy to evaluate your home or place of business, educate you about the best options, and provide you a chance to test out different stairway lifts in our showroom! We’re just a short drive from anywhere in NH, ME or VT.
For some people, the need for a stairlift is only temporary. 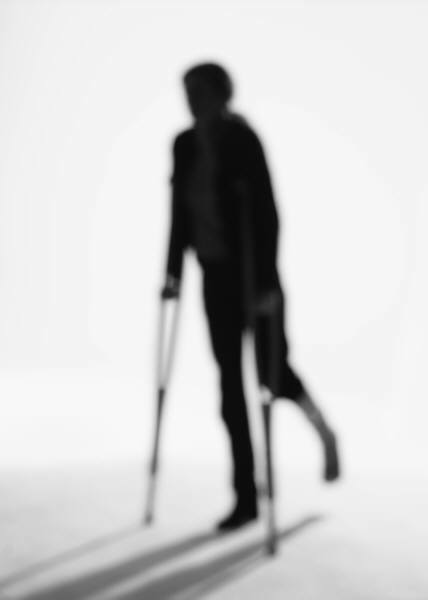 If you are recovering from an accident or surgery and your ability to climb stairs is restricted, don’t add insult to injury by sleeping on the couch or scooting up and down the stairs on your back side. Our stair lift rental program is a minimum of 3 months, and the price quoted includes installation along with 3 months rental. If you need the chair lift for more than 3 months, then we are happy to extend the rental. If your rehab turns into something more permanent, we can even convert your rental stairway lift into a purchase and apply a portion of your paid rental fees toward the purchase of the stair lift! When customers inquire about our stair lifts, more often then not, they usually inquire about the availability of a used lift. At All-Ways Accessible, we do sell used straight stairway lifts if we have them. However, used lifts are very popular, and our inventory does vary. But it never hurts to ask! We do buy back some straight stairlifts; it depends on how old they are, whether or not they have been serviced regularly, and how many we already have in inventory at the time. All Stairlifts that come to us go through a quality control certification process before moving to our certified pre owned stairlift inventory. If you purchase a used straight stairlift we do offer some type of labor warranty on the used stair lifts we sell. It varies by stairlift; age is usually the largest determining factor in the length of warranty. All-Ways Accessible is your local Stannah Dealer for New Hampshire, Maine, and Vermont. Stannah is a family-owned business with over 140 years of experience in the lifting industry. They make some of the world's best-selling stairlifts, and have sold over 500,000 globally. A good prouct depends partly on using quality materials, but far more on the skill of designers and engineers. Stannah has a worldwide reputation for thoughtful design; the stairlifts are styled to fit into your home, are easy to use, reliable, and have approprate safety features included as standard. Examples of the thoughtful design include the way stair lifts can be folded without bending down (especially important at the top of the stairs), the seat belt placement on the end of an armrest (much easier to reach than a seat belt by the hips) and the shape of the track which is narrow, and enclosed so that anything dropped on it falls harmlessly aside. All Stannah Stairlifts use a reliable battery system with a smart trickle-charger that plugs into a standard power outlet. Not only does this use very little electricity, it is also quiet and makes for a smooth ride that will allow you to use your stairlift in the event of a power outage. Click on the questions of interest to reveal its answer. Q. Can a stairway lift interfere with a pace maker? A. We surveyed several manufacturers regarding this question, and the short answer is no. The long answer involves very detailed engineering studies for RF Emissions (Radio Frequency Radiation). Basically, all those tests are done to ensure that the stair lift and the remote controls meet or exceed the FCC guide lines for safe RF Emissions. Q. What areas does All-Ways Accessible service for Stair Lifts? A. All-Ways Accessible sells, installs and services stair glide lifts in New Hampshire (NH), Maine (ME) and Vermont (VT). Q. Does the stair lift rail get installed on the wall? A. Many people think it attaches to the wall, but the stair lift rail is actually attached to the stairs. Q. Why not just buy a stair chair off the internet? They are cheaper. A. Cheaper does not always mean less expensive. If you buy a stair lift off the Internet, you have to install it yourself, you have no labor warranty, and you very often get an inferior stairlift. Most of the reputable manufacturers sell through dealers because dealers can support the stairway lift. Q. What do stair lifts cost? A. The price of a stair chair lift depends on many factors - is it a straight or curved stair way? Are you looking for a plain basic chair lift with standard features, or do you want a high end stair lift with custom upholstery and automatic folding options? Does the stairlift stop in front of a doorway at the bottom of the stairs? Do you need a power folding rail for the stair lift? Or do you want the chair lift to turn the corner at the top and/or bottom so it's out of the way of the stairs when it's parked? The answer to these and many more questions will help us determine which stair lift is best for you, your home and your budget! Q. What brands of electric stair lifts do you carry? Q. How do I know if my staircase is wide enough to fit a stairlift? A. Well, it's really not a matter of the lift fitting on the stairs, it's more a matter of the person using the stairlift being able to ride the stairway elevator comfortably and safely. If your stairs are 32 inches or wider, you are probably in good shape. However, we've done chair lifts on stairs as narrow as 26", but a lot has to do with the user's size and ability to turn his or her legs. So to answer the question - it might be possible to install a stair-lift on a small narrow stairway, but it is critical that we do the home evaluation to determine the safety of the installation for the person using the stairway lift. Q. My stairs are curved; do they make a stair chair lift that does turns? A. Yes, we do many curved stair lifts. Curved chair lifts are custom made so they require more time to manufacture and install, which also makes them more expensive than a straight stair chair lift. Q. My stairs have a pie shaped set of steps at the bottom - do they make a stair lift that will accommodate those types of stairs? A. Yes we can accommodate pie shaped stairs at the top, bottom or middle. Q. I live in a split level - will a stair lift work in my home? A. Yes, it's possible to install a stairway lift in a split level home, but it can be a challenge. There are number of options to consider so be sure to talk to a qualified lift specialist first. Q. Can you install a stair lift outside? A. Yes, but if you live in New England, we don’t recommend it, especially if you depend on the stairlift to gain access in and out of the house. Even if the manufacturer says the stairlift is for outside use, these products just don’t hold up to the ravages of New England weather. Plus salt and sand just add to the problem. A better option would be a ramp or a wheelchair lift. Q. What is the general weight capacity of a stair lift? A. It depends on the stair lift, but on an average they run between 300 pounds and 400 pounds. Q. What happens to my stair lift during a power outage? A. A battery-operated system will work for a limited time (approximately 20 times), allowing you to access to your entry/exit level. Q. Do you rent stair lifts? A. Yes. If you'd like to know more about our rental program, please contact our office. Q. How much does the stair lift stick out from the wall? A. It depends on the stair lift, but on average it’s 24 inches when in the riding position and 13 inches when folded up against the wall. Q. Will others in the house still be able to walk up the stairs if I have a stair lift on them? A. Yes. The seat, arms and footrest on the stairlift all fold up, leaving your stairs free for others to use. Q. How will I know which stair lift is best for me and my home? A. Our qualified Accessibility Specialist will perform a FREE site evaluation to suggest the best options for your needs and location, with no obligation. Q. How is the stair glide lift installed on the stairs? A. Bolts are installed directly into the treads approximately every 3-4 feet that hold the brackets to keep the stair lift secure. And yes, there will be holes in the stair treads. Q. Do I plug the stair lift charger into a standard household outlet? A. Yes, just make sure the outlet is not connected to a light switch. Q. Will it harm the chair lift if the batteries are over charged? A. Most battery chargers will not allow the batteries to over charge. Q. Do batteries and the charger come with the stairlift? A. Yes, if the stair lift is battery operated. Q. How do I properly store my stair lift for extended periods of non-use? A. Storage procedures can vary substantially depending on the model of stairlift. Please contact our office and we'll be happy to provide you with complete details on properly storing your chair lift. Q. Can a stair lift handle any stair way configuration? A. There is a make and model stairlift that can fit just about any type of stairway configuration. Most staircases are either straight, have a middle landing, or are curved/spiral. In some cases, a customer who has a middle landing can install 2 straight stair lifts; one lift on the first set of stairs and the other lift on the second set. Often times this is a far less expensive option than having a curved stair lift installed. Keep in mind that the person who uses the lift must be able to transfer from one lift to other at the middle landing in order to use this two-lift option. Q. Do I need to do anything special to prepare my home for a stair lift? A. Not really, unless you don't have an electrical outlet to support the operation of the stair lift. In this case, you would need an electrician to install an outlet before the stair lift is installed. In some cases, the hand rail might need to be removed if it obstructs the operation of the stair lift. Q. How is the stair lift secured to the stairway? A. The stair lift is bolted directly to the stair tread. It requires rail brackets about every 3-4 ft.
Q. What is the difference between an A/C powered chair lift and a battery Operated stairway lift? What are the pros and cons? A. An A/C unit is powered by plugging it into a standard household outlet. If the electricity goes out, the stair lift will not operate. But there are no batteries to replace over time. A Battery Operated Stairlift (BOS) receives its operating power from a standard 12V battery. The batteries are charged through use of a wall powered charger. The BOS will operate if there is an electrical power failure for as long as the batteries last (typically 20 trips). Batteries (in pairs) for these lifts need to be changed every 2-4 years, depending on use. Typical cost for 12V batteries are $65-$75 each. Q. Will my stair chair lift operate if the power goes out? A. An A/C powered (plugs into the wall) stair lift will not operate after the power of the house is terminated. A BOS (Battery Operated System) stair glide will work for a limited time. Q. Will a chair lift work for someone who also uses a wheelchair? A. Yes, however, the person who uses the wheelchair will need to transfer from his or her wheelchair onto the stairlift, and then the wheelchair must be carried up the stairs by someone else, or a second wheelchair must be located on the second floor. Convenience features built into some stairlift models that aid wheelchair users include folding arms that push up and out of the way, adjustable seat heights, and soft, padded seats. Q. How will the stair lift look in my home? A. You can typically choose from a wide variety of colors and fabrics. Upholstery options include easy-to-care- for vinyl and fabric. Chair and track colors can be chosen to blend with most home décor. Q. What about safety features on the stair lift? A. Key safety features on most stair lifts include a seat belt, obstruction sensors that will stop the lift should something block its path, and a swivel seat lock that holds the stairlift in place while you get on or off. Constant pressure controls ensure the stairlift will stop if you release your finger from the controls. Q. Are stair lifts easy to care for? A. Yes. Stairlifts are designed to last for many years. Most stair lifts come with a manufacturer's warranty; the length of warranty can vary depending on the make and model of stairlift you choose. They should be serviced annually by a qualified technician to be sure the mechanics and safety features are working properly, and they are going to need replacement batteries every few years depending on how often the stair lift is used. Q. Can stair lifts be installed on any shape of staircase? A. Yes. We have a variety of stair lifts that will fit almost any set of stairs. For almost 20 years, we have seen a variety of staircase configurations ranging from 'straight run' or 'L-shape' to 'sweeping curve' and also staircases that have a turn at the very top of the flight, with triangular-shaped steps at the turn. All-Ways Accessible, Inc. has installed lifts on all of these configurations. Q. Is there a need to have rewiring done in my home? A. No. As long as you have an outlet somewhere near the stair lift so a power cord (for either the lift or the battery charger) can plug into the outlet, you don’t need to do anything. However, if the only available outlet is controlled by a light switch, then you should have an electrician install a new outlet for the stairlift. Q. Can a stair lift be installed if there is a door at the top of my stairs? A. Yes. We have installed all models of our stair lifts with doors at the top. Often times, if this is the case, there will need to be a slight modification to the rail installation to accommodate the landing height at the top of the stairs. This is called ramping. This is one of the key reasons why it is important for an accessibility specialist to visit the home and evaluate the stairway prior to the installation. Q. Does the stair lift rail attach to the wall? A. No. The rail is designed to attach to the stair tread with support brackets periodically spaced. Keeping the rail on the stairs ensures the utmost stability and the minimum protrusion into the hallway. Q. I have hardwood stair treads - will the stair lift installation damage those treads? A. No, it won't damage them, but the stair lift rail does get bolted into the stair tread, so there will be holes. Once a stair lift is removed, we recommend that these holes be filled by a craftsperson/carpenter. Any repair to the stairs following the removal of a stair chair lift is the responsibility of the home owner. Q. What is the expected life span of a stair lift? A. Modern stair lifts are very durable and reliable pieces of equipment. All our stair lifts are built using the very highest quality components and workmanship. You can be confident that our stair lift will give many years of faithful service, provided the stairlift is maintained properly. Q. Does my electric stair lift need to be serviced on a regular basis and if so how often? A. Yes. It is HIGHLY recommended that a chairlift be serviced at least once per year. Not only does regular maintenance help prevent expensive emergency service calls, but it is mandated by the ASME handicap lift code. All stairway lifts are designed with a series of safety mechanisms. These mechanisms need to be tested on a regular basis. As with any mechanical part, these safety mechanisms can wear over time and really need to be evaluated on a regular basis. Q. Does my new stair chair lift come with a warranty? A. Warranties vary by manufacturer, but yes, just about every home stair lift comes with some type of product warranty. These can range from 1 year to "a life time". But be mindful of the fine print. Many times the "life time" warranty is usually on the motor or the lift frame. These are the parts of a stair lift that are the least likely to fail. It's all the other moveable parts that usually cause problems over time. And most manufacturers do not cover labor. So make sure you read your warranty and understand what's covered and what's not. All-Ways Accessible, Inc. provides a 1 year labor warranty on any new stairlifts we install. Q. How long does it take to install a stair lift? How disruptive is it? A. The time it takes to install a stairway lift depends on the make and model. Most straight stairway lifts can be installed in 3-4 hours. The disruption is minimal. Our factory-trained technicians are very professional and efficient. Q. How long do the batteries in a stair lift last? A. There are several factors involved in the life of a battery but the short answer is about 3 years depending on the usage of the lift. Q. Why is an adjustable seat height so popular? A. When it comes to a proper seat height, one size does not fit all. Being able to adjust the seat height on a stairway lift can greatly improve the comfort and safety of the ride. Not all stair lift models have an adjustable seat height so be sure double check this before you buy. Q. Why are there so many variations and options? A. Everyone's needs and abilities are different. That's why it's so important for us to meet the person who will actually use the stairlift. We take into account his or her abilities at the time of install and also consider any changes that may occur in the future. Q. Can I lock the stair-lift to avoid misuse from others? A. Yes. Some stair lifts have an on/off key that allows you to control who can use the stair lift. Keep in mind that these chairlifts can be very attractive to small children and even though they are extremely safe, no equipment should be used without adult supervision.